A tale is told that a place called Sweet Gum Bottom, outside of Andalusia, Alabama, is home to a headless woman searching for her assailant. A woman gives a friend’s name and account of the town’s last encounter with the headless woman to date. A man named McVay was headed out from Andalusia and came upon the hollow amidst the densely wooded countryside. He heard his back tailgate rattle and unlatch, and from his rearview mirror, Mcvay gasped at the image of a headless woman clutched onto the sides of his truck, hiking her leg to climb into the vehicle with him. He slammed on the gas and she lost her grip. Afraid someone would be coming for her, it seemed, she hunched her shoulders, gripped her dress, and took off back into the woods. The DeSoto caverns were claimed by the Creek tribes of the area when I.W. Wright was traveling through to trade and negotiate with the natives in the early 1700’s. Wright stopped and napped in the cavernous solitude. After he felt well rested, he gathered his belongings, carved his name and the date in the side of the cave in a “Wright was here” fashion, and started on his way. When his vandalism was found out, he was allegedly captured, scalped, and killed for his disrespect. Remains were reportedly found in the nearby area, the name “Wright” carved deeply into one of the bones. “Sacred to the memory of William Patterson who departed from this life May 29, 1847. Aged 30 years. When sorrow weeps on virtue’s sacred dust/ Our tears become us and our grief is just. Such were the tears she shed who gratefully pays/ This last sad tribute of her love and praise.” Mr William B. Patterson was a young bachelor who is said to have taken his fair part in drinking, brawling, dancing and horse racing. It is rumored that the forbidden lover who wrote this beautifully emotional tribute to William was an Italian belle over whom he had dueled and lost. He owned a cotton gin on present day Dryer Avenue, and his plantation was located where Highway 98 runs now, just outside of Village Point Park Preserve, the park that Jackson Oak calls home. When the streets were being laid, his headstone displaying these beautiful words was moved out of the way, now displayed just off the road, but his body was never exhumed, so he is still resting just under the highway. Seamen's Bethel Chapel Theatre was built in 1860 in downtown Mobile, Alabama, used as a refuge for sailors. In the 1980's it was relocated to the campus of the University of South Alabama, and it seems two spirits made the move along with the building. People attending and participating in performances in the theatre have reported seeing the same tall man in the fly loft, wearing a sailor cap and a captain's coat. Others that have used the basement area as a dressing room report a small child running wildly through racks of clothes and chilling folks with her laughter, just before she vanishes. Sloss Furnace in Birmingham, Alabama was built in the 1880's and stayed in operation until the 1970's. Working conditions were incredibly dangerous at times, and this now nationally recognized Historic Landmark has seen its unimaginable share of tragically fatal accidents. Grown men's guttural screams, forceful shoving by invisible entities (especially while crossing high risers and rafters), heavy footsteps chasing closely behind, and even deceptive changes in pathways while folks are carefully navigating the grounds. The paranormally charged site is a overwhelmingly shared belief, reports flooding in by locals and tourists every year leading up to the famous FrightFurnace.com haunted spectacle of a tour. The route carved out by Jackson and his men, stopping in the Daphne area to give his speeches and motivations from the branches of what is now known as Jackson’s Oak, is called Jackson’s trail, leading across Baldwin County to Pensacola. Jackson was on his way to Pensacola from New Orleans to stop the British from occupying Spanish ports. When he and his men reached Pensacola, he was unwilling to negotiate terms, and the British replied by blowing up the fort and sailing away. On this day, May 5th in 1937, Alabama’s 22 year ban on liquor was lifted and legal hooch sales returned to the state. But did you know that the hottest spots to hang during the years of the illegal party scene were actually underground? Three caves in Alabama are noted to have housed quite a few all-nighters in their day. DeSoto Caverns was known as “The Bloody Bucket” due to the Road House style crew it attracted. Shelta Cave, operating as a party palace before prohibition as well, was given electric lighting and was not at all deterred by illegal liquor sales. Bangor Cave, pictured above, was a speakeasy in the 1920’s and gained popularity as “America’s Only Underground Nightclub.” Papers falsely read that the hot spot was newly opened in 1937, just as Alabama’s illegal liquor law was abolished. How convenient. Today’s Alabama oddity is the tale of Eufaula’s property owning plant. 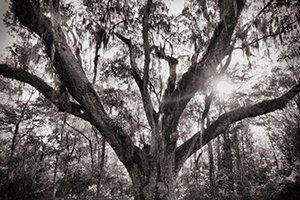 An amazing oak tree has been standing longer than most buildings in Eufaula, Alabama. The home of Confederate Captain John Walker, just feet from where the tree resides, burned to the ground after the Civil War, and the tree went on unscathed. Not even the destructive hurricane that swept through Alabama in 1919 damaged the mighty oak. By 1936, the oak stretched to 66 feet in height and a whopping 85 feet wide. The city wanted to preserve the tree with honor, so a “deed of sentiment” was written for the tree and “by” the tree, so that the Walker Oak could quite literally own itself. When the mighty tree finally met its fate in 1961 at the terror of a tornado, area newspapers prominently announced its death in the obituaries. On a sunny day in Wilcox County, Alabama in the spring of 1956, people were baffled by the strange cloud looming over them. The fear set in only when they realized that it wasn’t rain falling from the sky, but live fish: local bass, brim, and catfish! Yes, they were confused, but not scared enough to realize that dinner was being delivered, and quickly pulled out buckets and boxes to catch the odd bounty. Fish rains have been reported numerous times across Alabama, and the explanation for them is actually quite simple. Water spouts or concentrated whirlwinds that sit over one of the many bodies of water surrounding and running through Dixie causes these fish to be shot straight into the air. If they reach high enough, these creatures can be carried for miles before falling back down on unsuspecting folks. May Day Celebrations lasted for over 50 years in the Jubilee City. The original May Day Celebrations in Daphne, Alabama were started as fund raisers for this State Normal School that faced the modern day May Day Park. These two day long festivities included an entire tableaux by a court of maidens to dance the maypole and crown the year's reigning May Day Queen. This structure of the Normal School no longer stands, but it was once an institution to educate teachers in Alabama. Before the establishment of the school in 1907, the building was the center of a countywide quarrel between the cities of Daphne and Bay Minette. As the building was built to house the county seat, the state voted to move the seat to Bay Minette shortly after it arrived. 32 years, actually. Yet, Daphne didn't want to give it up. The people of Bay Minette devised a grand ruse to steal the seat from this building late one night, and actually pulled it off. Bay Minette is the County Seat for Baldwin County today, because they literally stole it. When legislation was passed down for it to be moved, Daphne ignored the order. So the adamant citizens of the town to the north made up a story of a fugitive on the loose, sending the Daphne sheriff on a wild goose chase. When he was out of the building, the coast was clear for the Bay Minette citizens to break in and steal the Judge’s entire desk and contents along with stacks of county records, plus the single inmate, and take them back to town. The people of Bay Minette celebrated by painting a pretty creepy mural on the side of the Post Office.